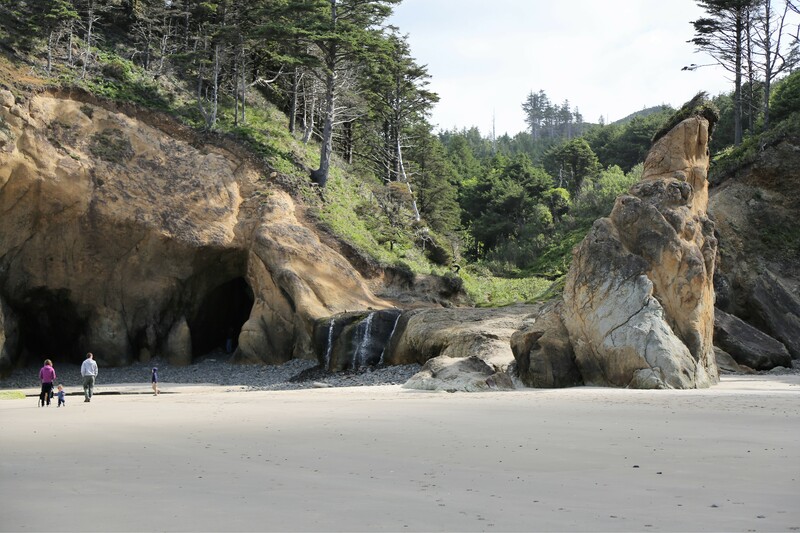 Our trip was a nine day road trip from the SeaTac Airport just south of Seattle, Washington to San Francisco. The route was plotted out to be 150 – 250 miles driving a day with 3 or 4 highlights visited each day. We were blessed with good weather the entire trip. We were also able to visit several touted sites without too much competition from crowds. I took about 3000 pics and I am going to share about 15 from each day of the trip over the next couple of weeks. One of my goals was to catch as many sunrises and sunsets as possible. I knew ahead of time I would be alone for the sunrises. My travel buddies are not as enthusiastic about seeing the break of day as I am. I have already posted pictures of Day One and portions of Day Six and Eight in previous posts. Check out Lesson in Love and Justice on Mt Tamalpais for Day Eight and Walking Among Giants for Day Six. Without further ado, here are Day Two Pics. From Seaside we headed south a little ways to Cannon Beach and then Hug Point before backtracking and taking highway 27 into Portland. 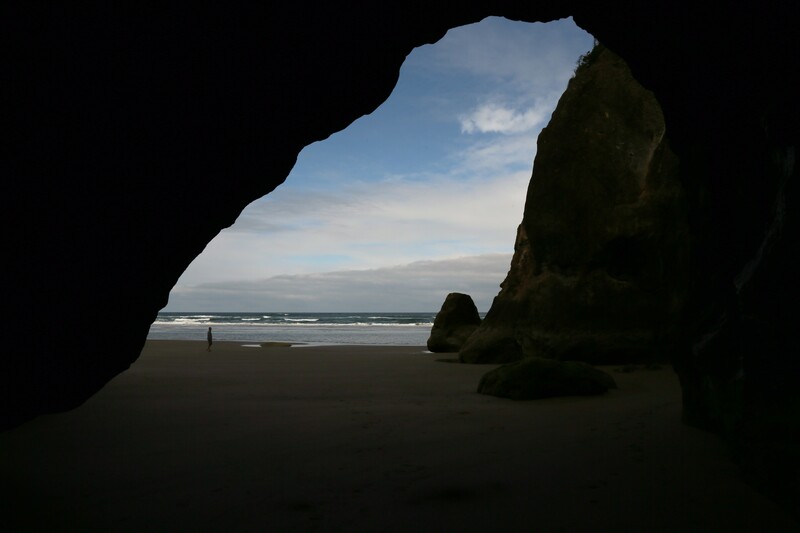 Haystack rock at Cannon Beach. 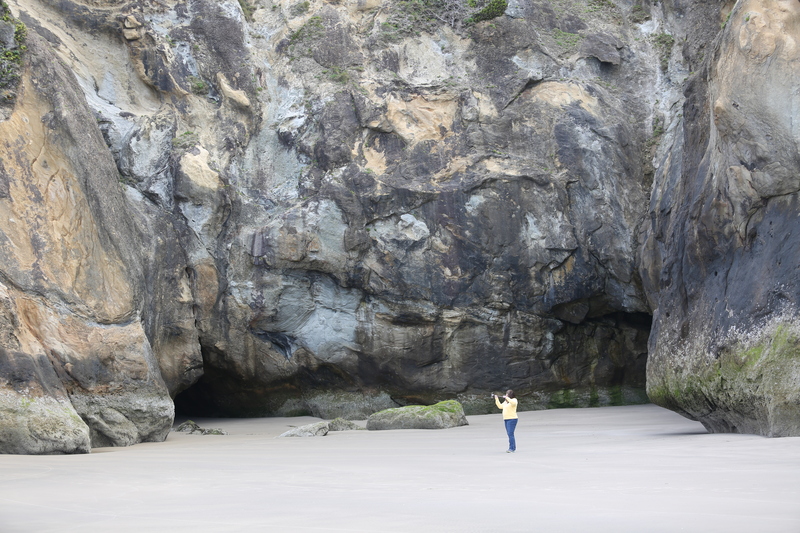 Note the person on the beach in front of the rock to get the scale of the rock. 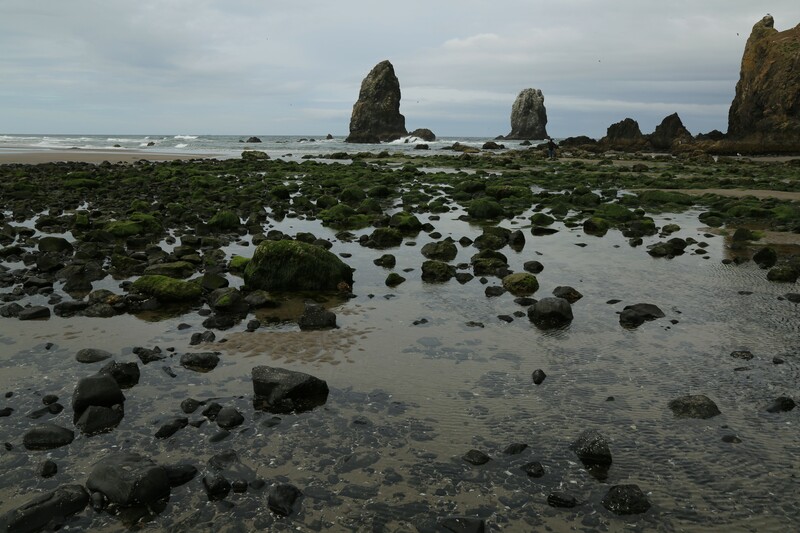 Tide pool at the base of Haystack Rock in Cannon Beach, Oregon. Cannon Beach at Low Tide. It was mid morning and low clouds were still hanging around. 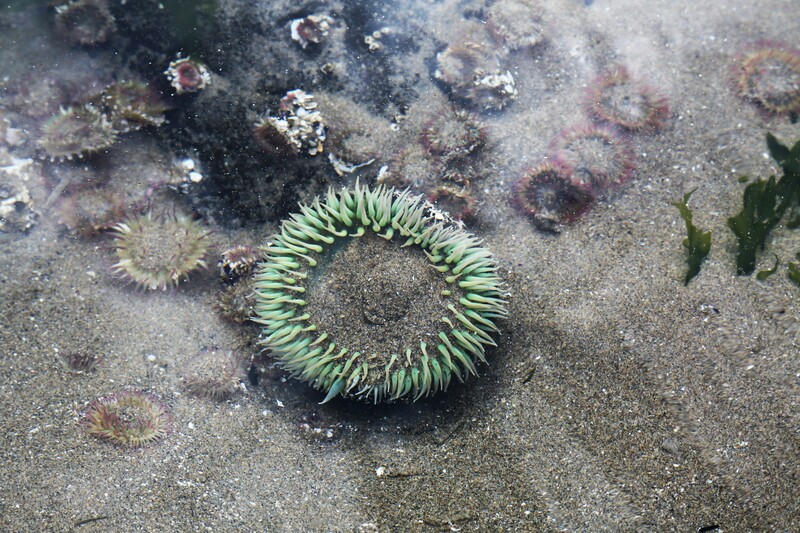 Lots of cool sea creatures live in the tidal zone like this anemone. 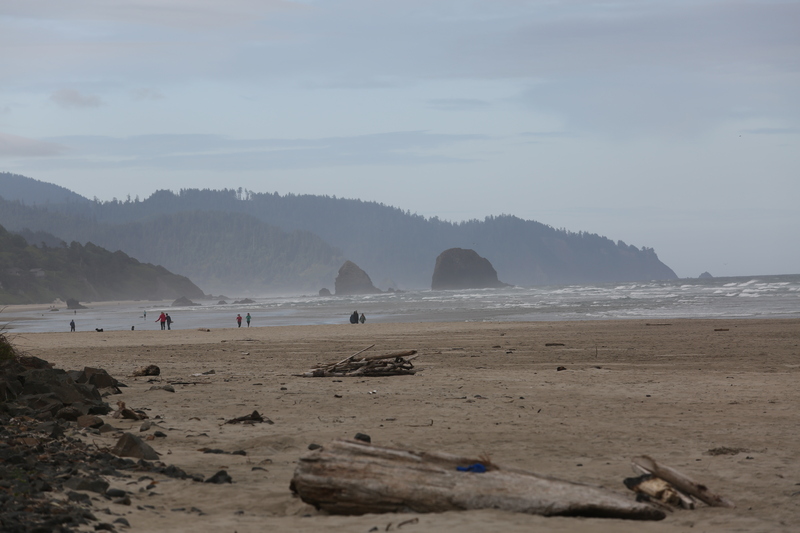 Another view southward on Cannon Beach. 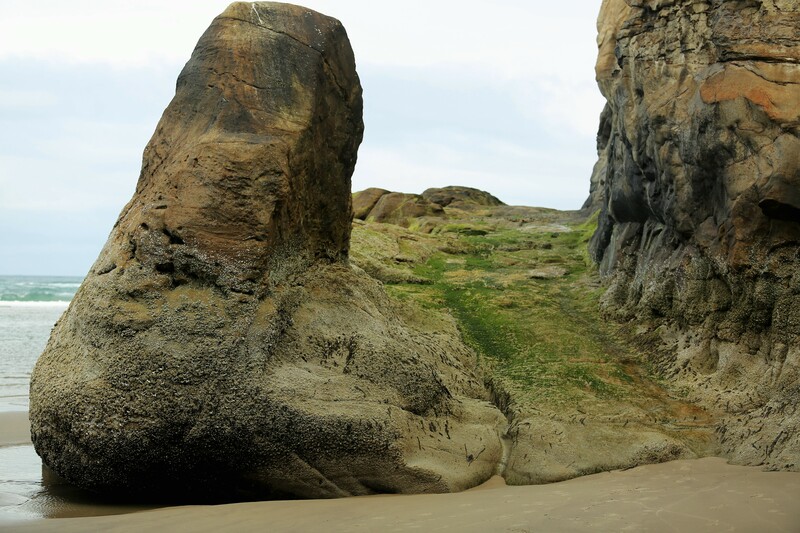 We drove about half of the Oregon Coast on the trip and this is fairly indicative of what it is like. 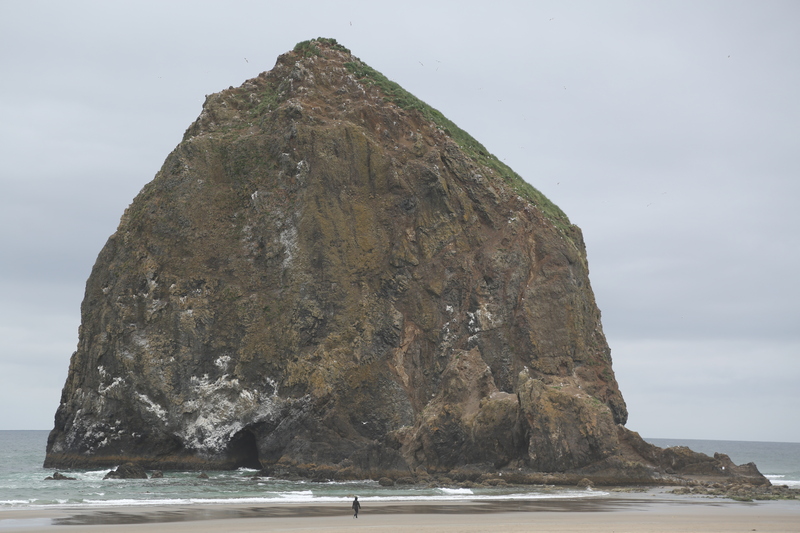 Haystack Rock was alive with Sea Birds. This gull was fluffing up it’s nest. 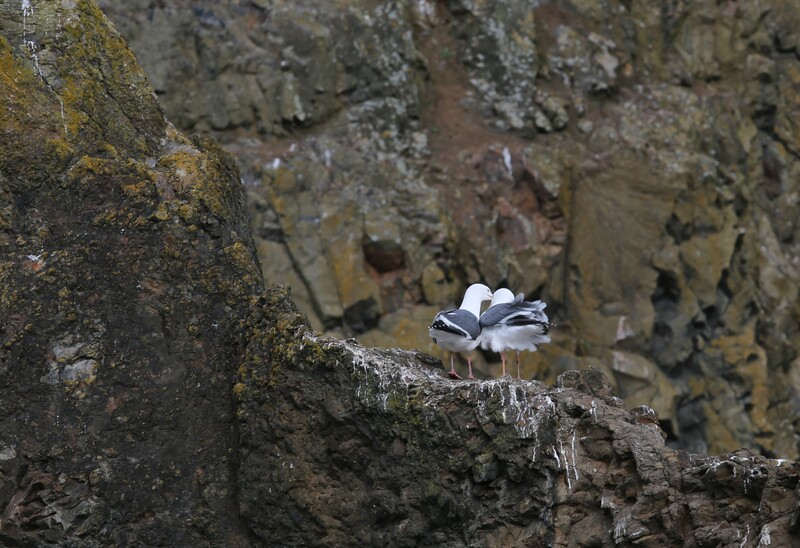 There were also dozens of cormorant and puffins roosting on the Rock. 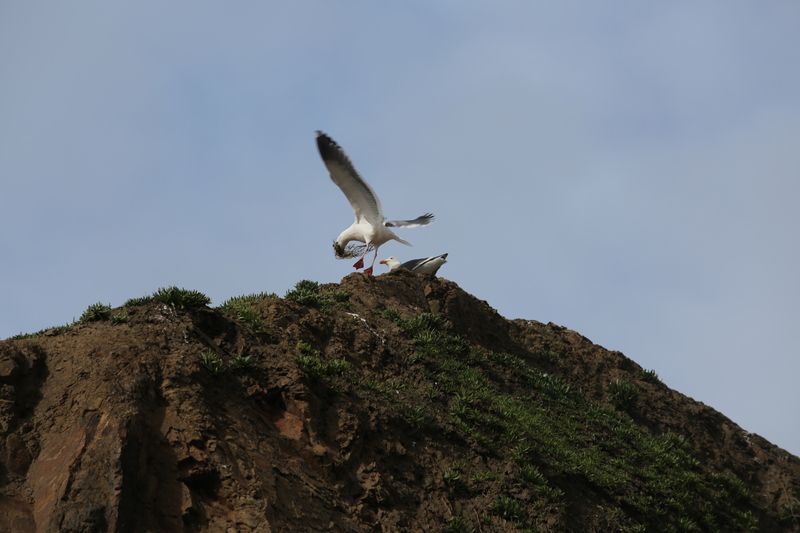 These gulls did a dance for about 30 seconds when one flew in. They alternately bobbed and sang to each other. The term “Love Birds” came to mind as I watched. 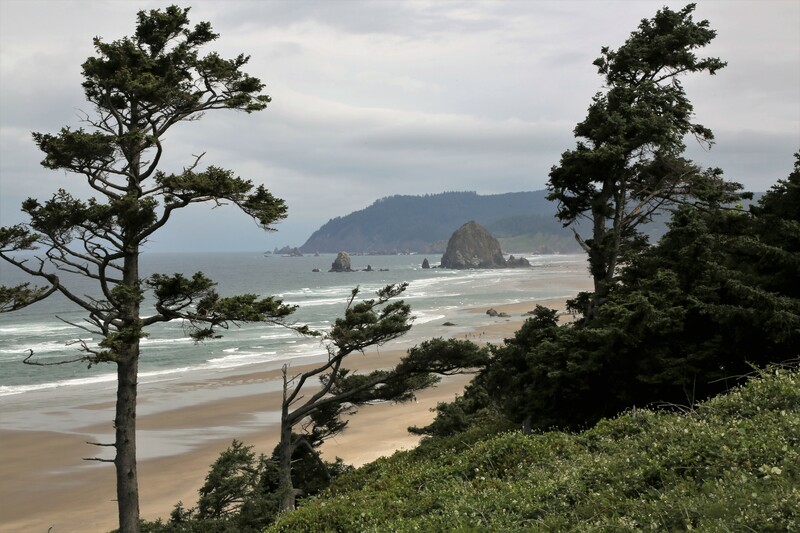 View of Haystack Rock from the south. These are called Sea Stacks. They are the harder rock that stands longer while the softer rock and soil is eroded by years of pounding surf, storms, and winds. 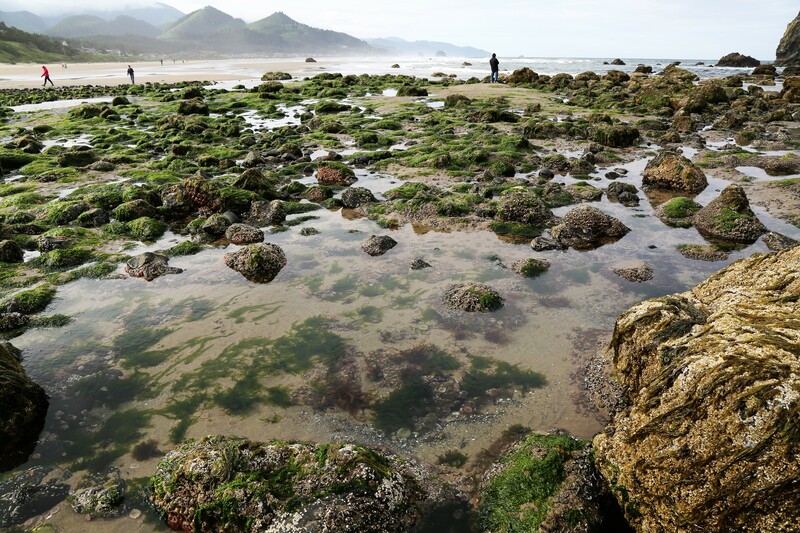 In the days before modern roads, the coast at low tide was the road. At Hug Point the rocks extended out into the sea so they carved this road into the rock for the Mail Delivery carts. The road hugged the point here. This steep sided cove is really cool. Those are two sea caves behind Lisa. At low tide there is plenty of space here, but at high tide the water comes up into this cove area, continuing to erode the caves further. Another interesting phenomenon was the almost constant swirl of wind in the cove. 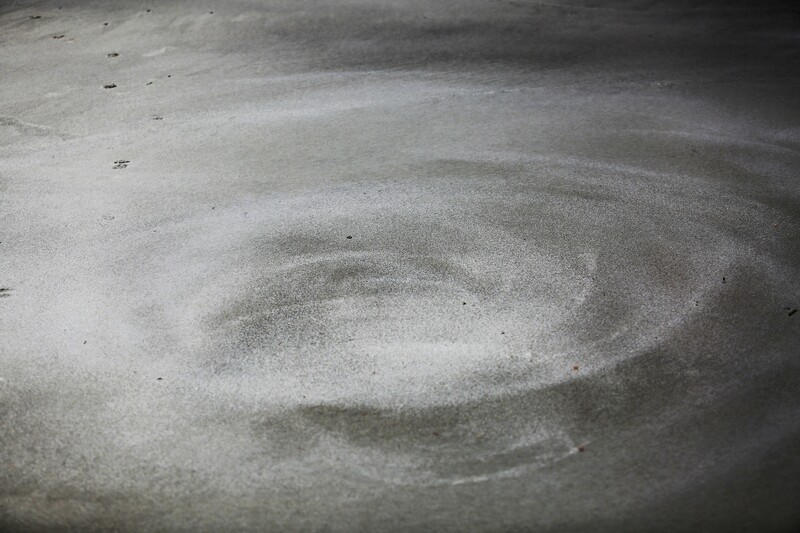 The onshore wind hits the steep sides and spins a whirlwind which creates this pretty spinning patter in the hard packed sand. 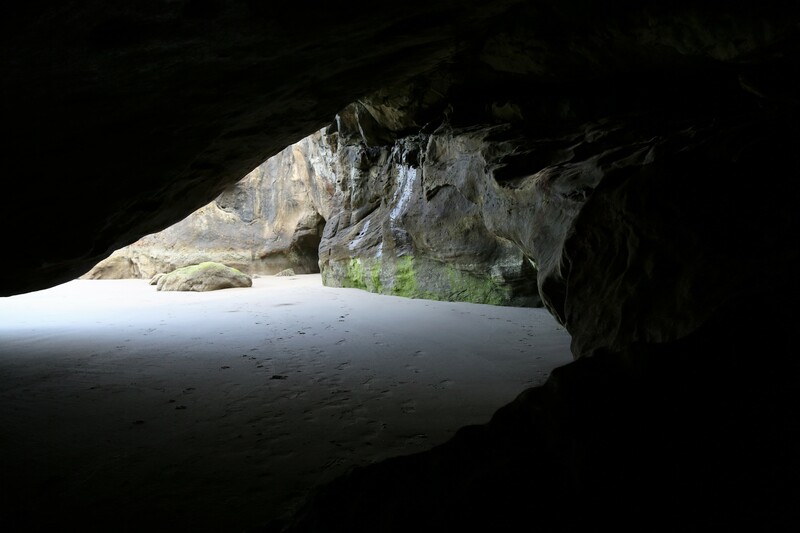 View from back in one of the Sea Caves. The coastal mountains strain off a lot of moisture coming in from the Pacific Ocean creating numerous streams back to the sea. 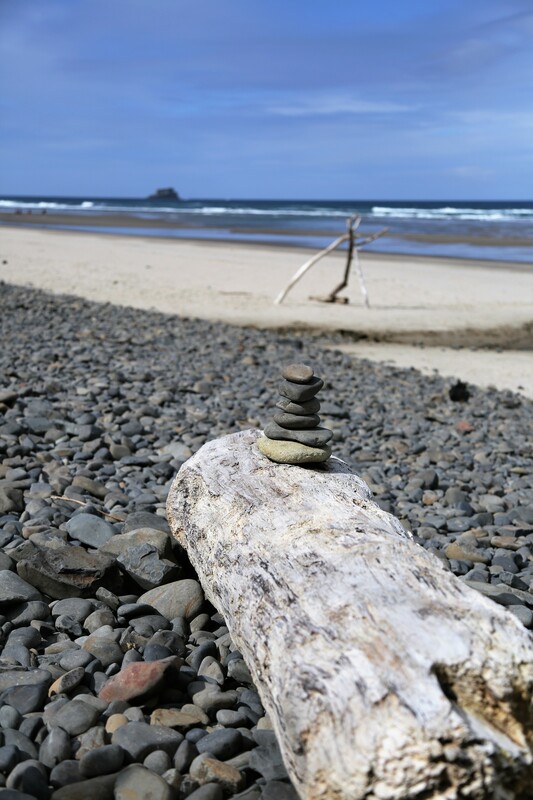 My trademark – I take pictures and leave cairns. It was late morning after visiting these two beaches so we decided to head inland. 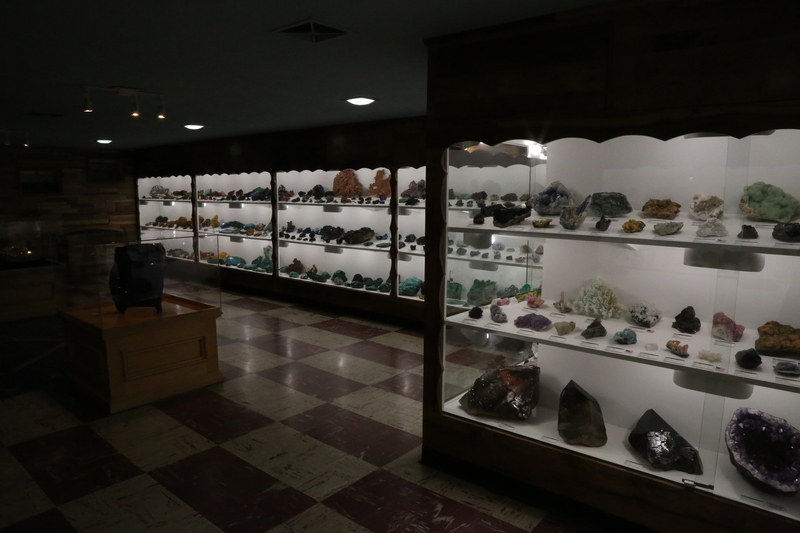 The Rice NW Rock and Mineral Museum was right on the way so we decided to check it out. This is in the family home of the Rice’s. They were geologists who gathered hundreds of rocks and minerals over their lifetime from all over the world. Their focus was the Pacific Northwest, which apparently is a rock and mineral gold mine (do you even have to ask if the pun was intended or not?) It was a fun visit and surprisingly comprehensive. Check it out on TripAdvisor which is where I found it. 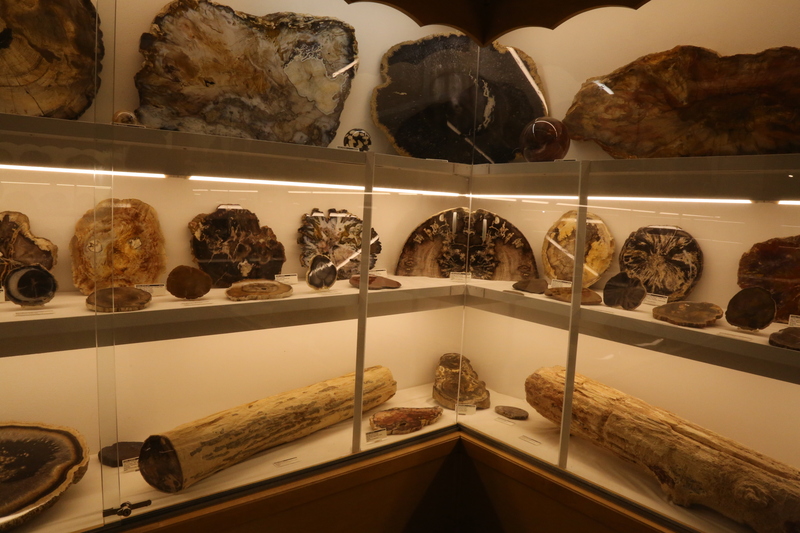 Fossilized wood of a variety of species. I had no idea how beautiful a slice of petrified wood could be. 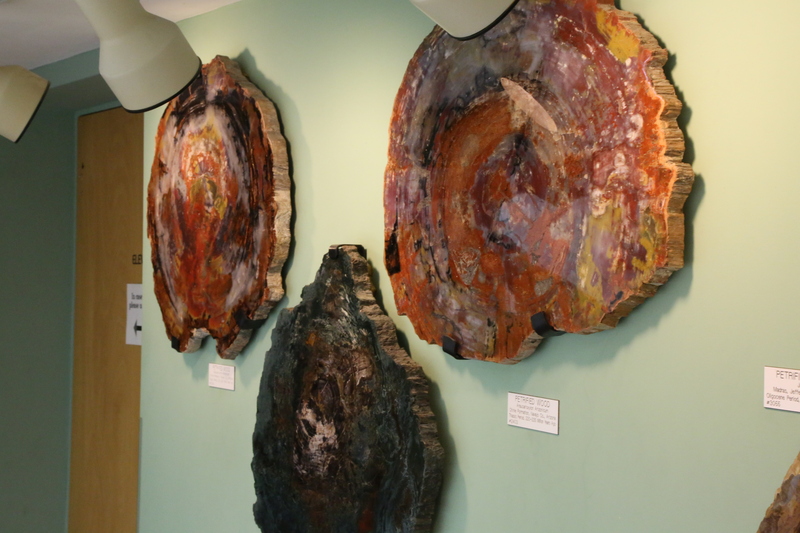 These are as much pieces of art as they are rock specimens. The Rice family collection is the basis for museum, but there are pieces from many of their peers and friends. 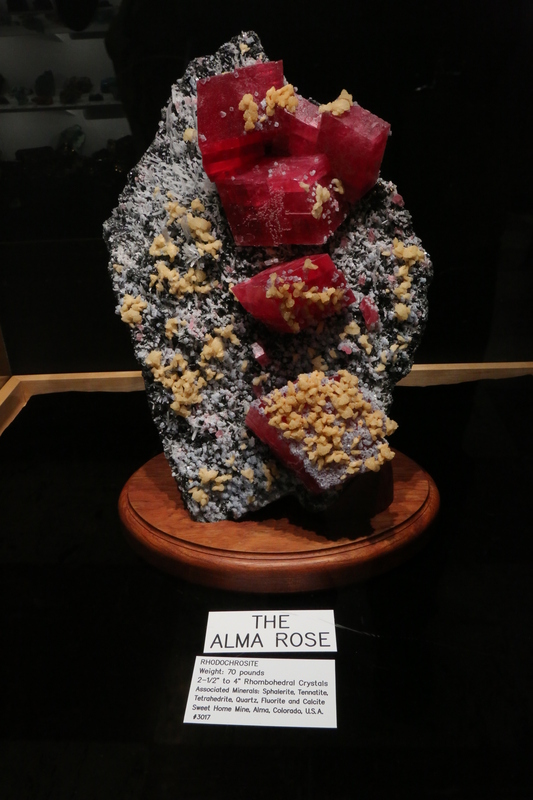 The Alma Rose is one of the centerpiece exhibits. The museum was informative and entertaining. On to Portland. 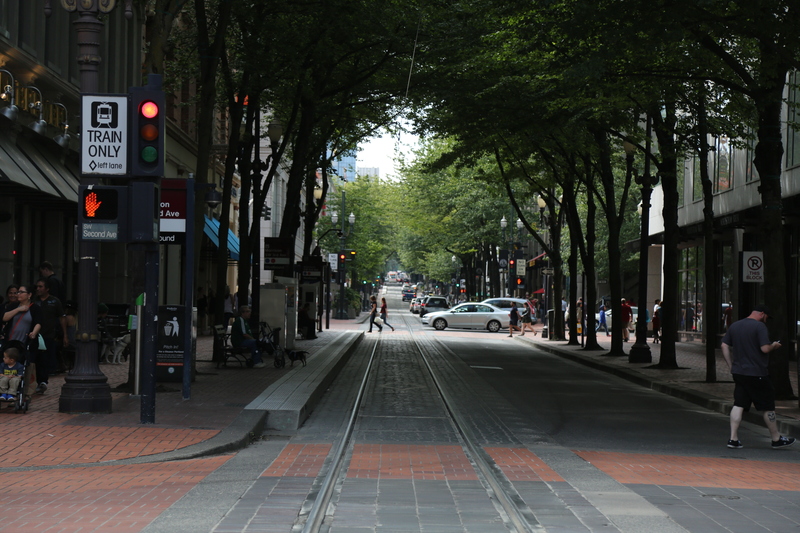 We checked into our hotel and immediately headed into town on the MAX, the Portland Light Rail system. 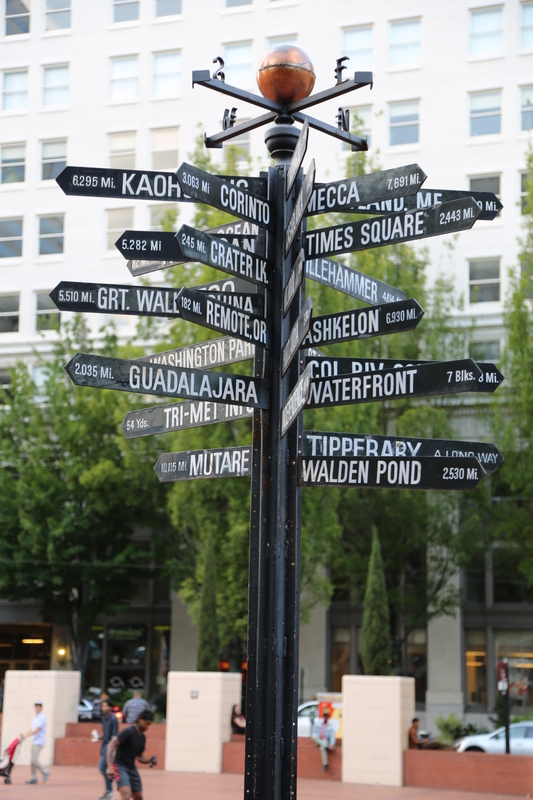 Our destinations were 1) the Saturday Market, 2) The Japanese Garden, 3) the International Rose Garden, and then dinner at the City Grill. The MAX lightrail system in Portland. 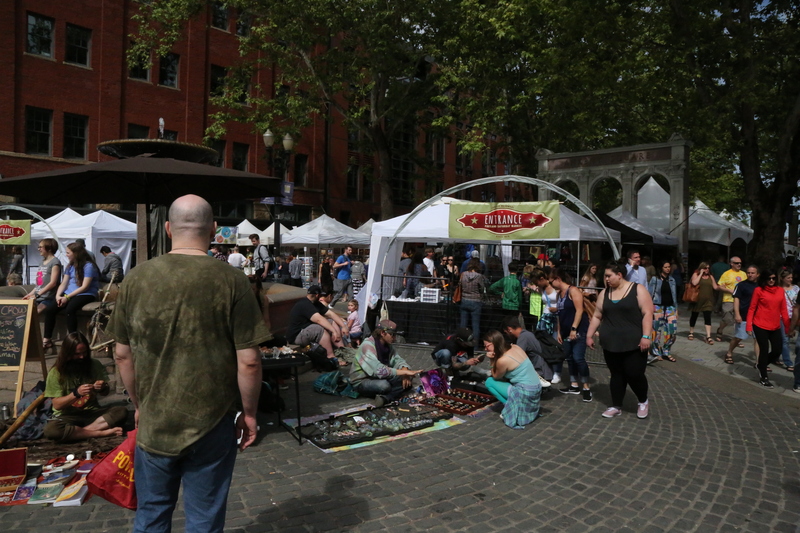 A couple hundred vendors with almost anything you can imagine for sale. Did I mention that Oregon has recreational marijuana sales? There were plenty of shops offering medical and recreational MJ for sale. These are some of the street people semi-stalls. These were not part of the official Saturday Market, but they were positioned just outside the market and took advantage of the crowds. There were large numbers of homeless in this area. Between the marijuana, the unwashed bodies, the multiple open air grilles of a variety of ethnic food choices – it was unusually aromatic. 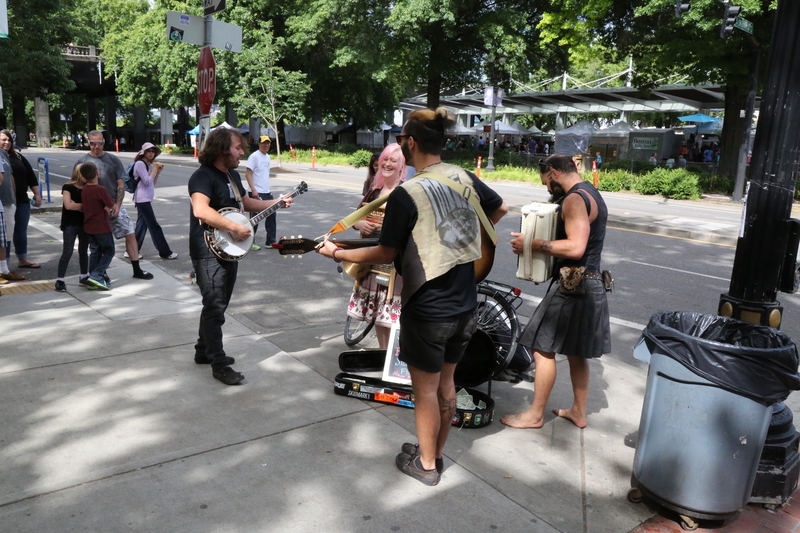 There were plenty of musicians ranging from some fairly elaborate bands, to this semi-organized group, to homeless people playing percussion on assorted buckets and cans looking for handouts. Variety was definitely the watch-word. 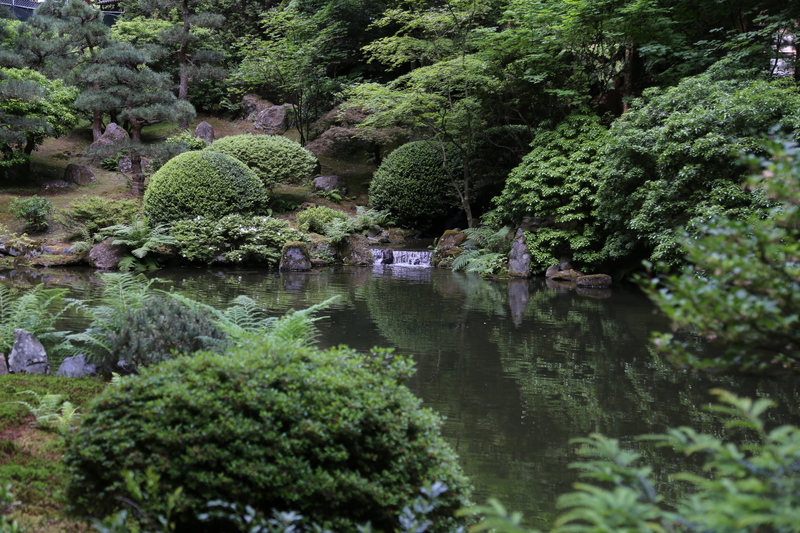 One of the peaceful ponds in the Japanese Garden. 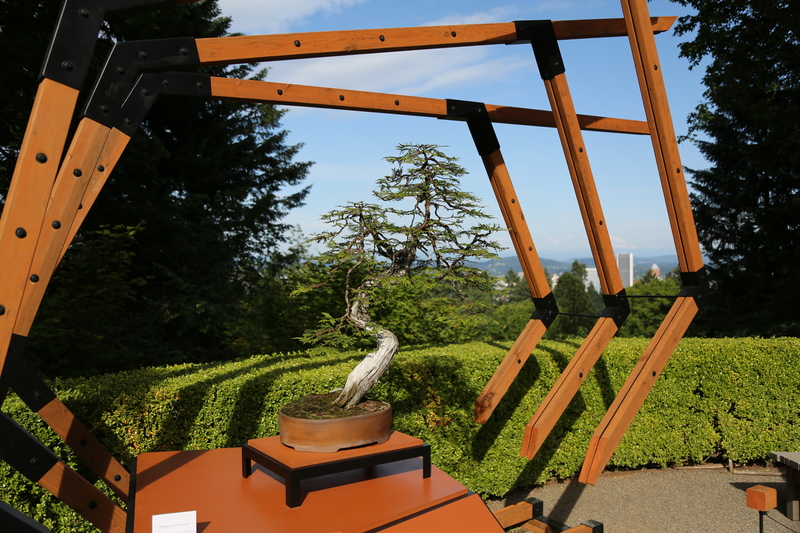 The American Bonzai was the special exhibit in the Japanese Garden. This tree is over 100 years old. 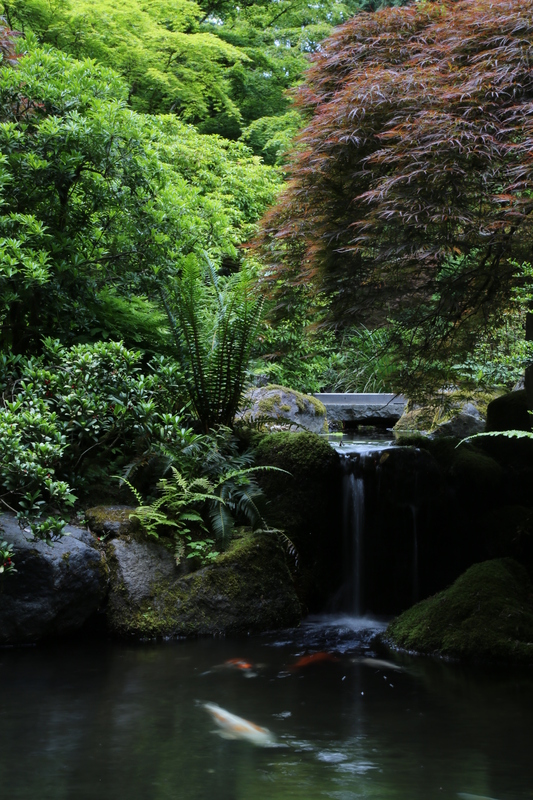 The Japanese Garden is located inside Washington Park on the slopes west of the city of Portland. 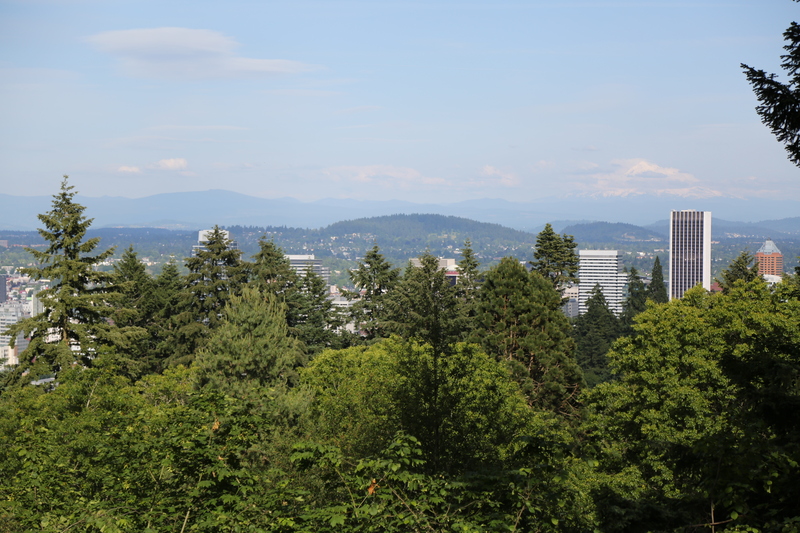 From here you can look across downtown Portland to Mount Hood. 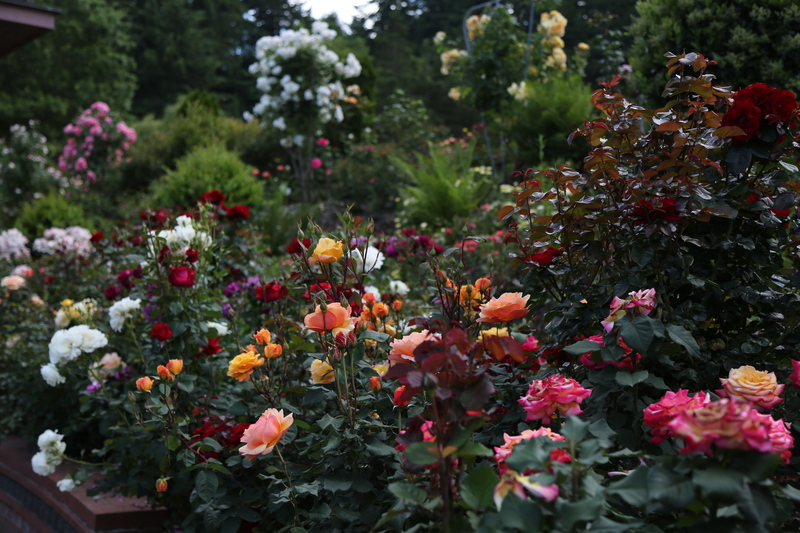 The International Rose Test Garden was an absolute riot of color. 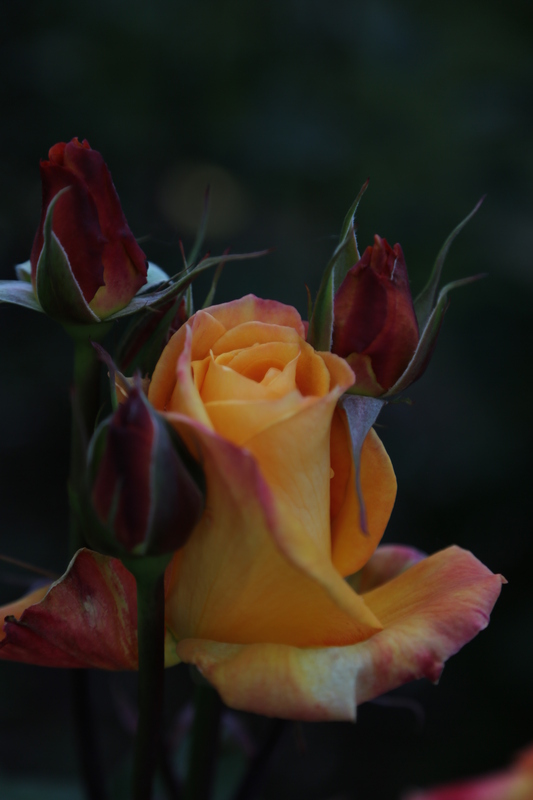 Surprisingly only about 1 in 10 of the roses were fragrant. 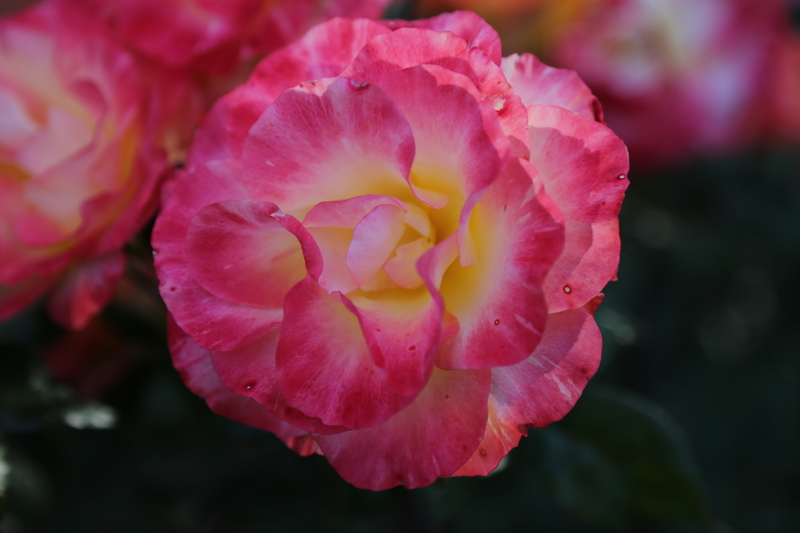 But almost all were rich in color and in full bloom. We unknowingly arrived in the midst of the Rose Festival. 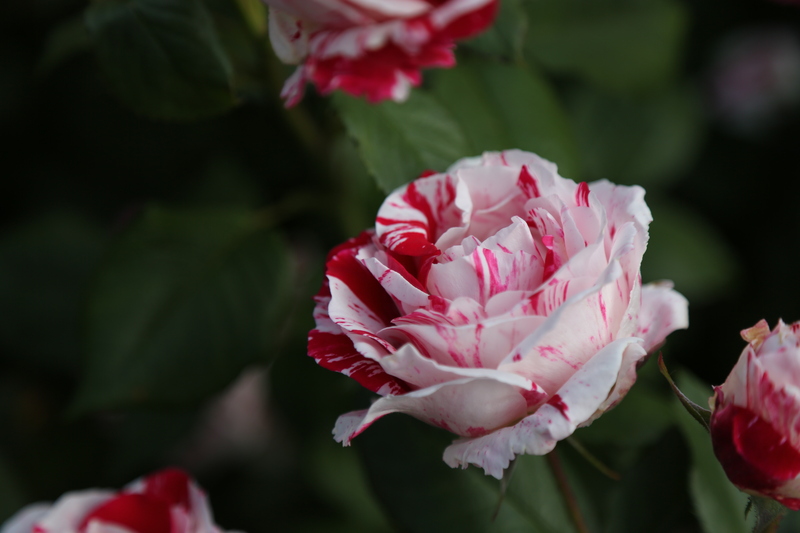 This rose was so beautiful and luscious looking it made me think of a milkshake. I’m not sure why. There were many beds of roses of single varieties, but I was drawn to this bed of a mixture of award winning roses creating a palate of colors. 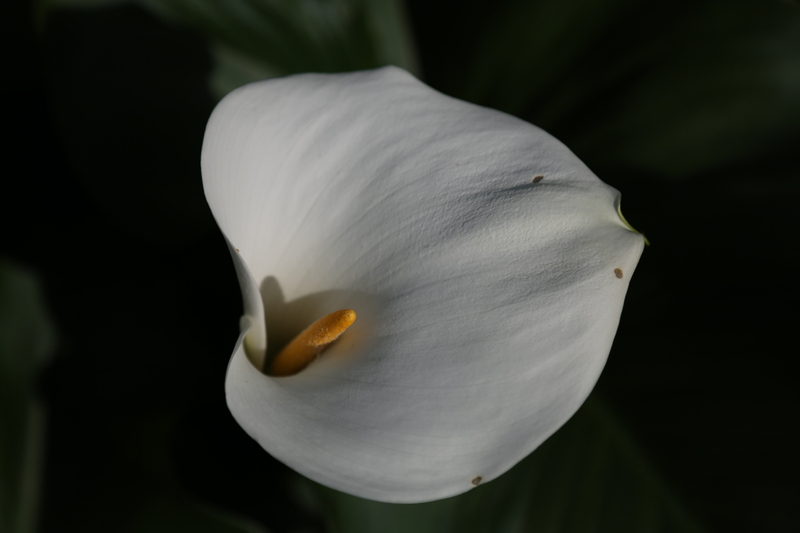 One small section of the garden was an English style tea garden where I spied this Calla Lily straining toward the late afternoon sun. 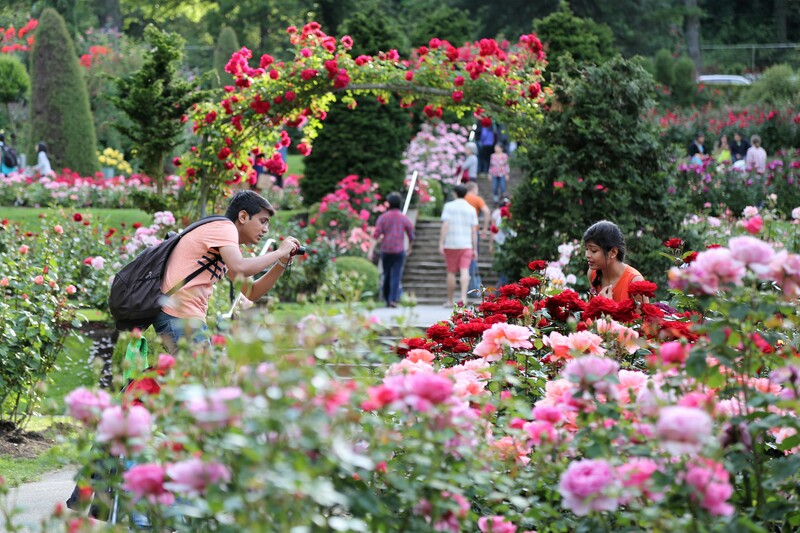 There were hundreds of people wandering through the gardens snapping pictures of all sorts. There were prom pictures, wedding pictures, family photos, tons of “selfie with rose” pics, and of course lots, of couples-in-love pics. 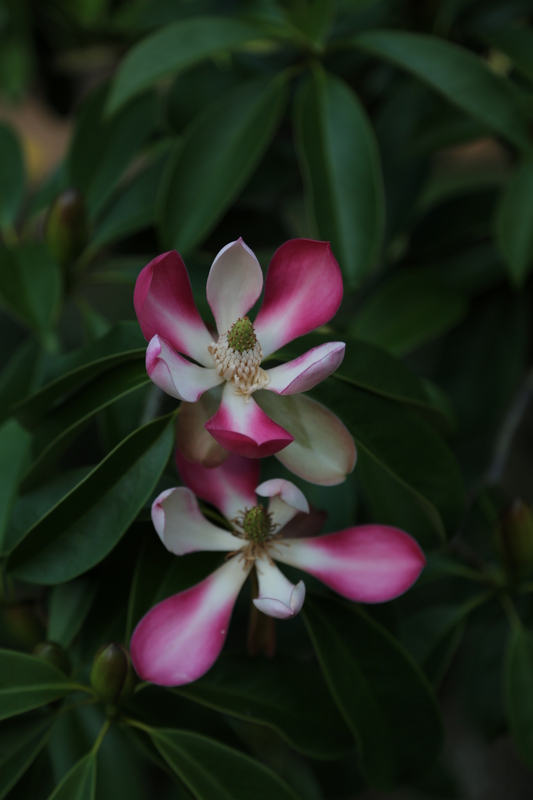 It’s funny, we left the Rose Garden with it’s thousands of gorgeous blooms and yet, I think I like this simple magnolia bloom just as much. 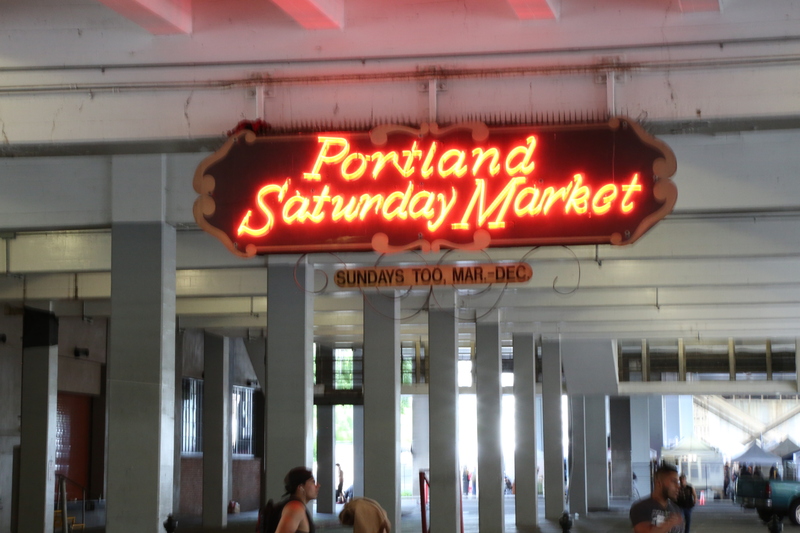 We got lost a time or two, but handy signs like this one helped point us in… many directions at once. 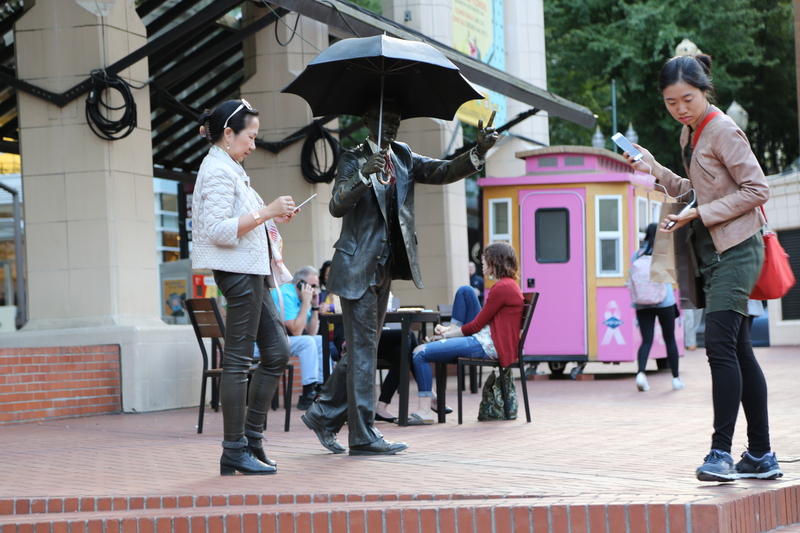 So we sought some advice from a guy who looked like he knew the place pretty well. He didn’t say much but fortunately he was pointing the way to the City Grille. A great dinner and a million dollar view from the 30th floor. 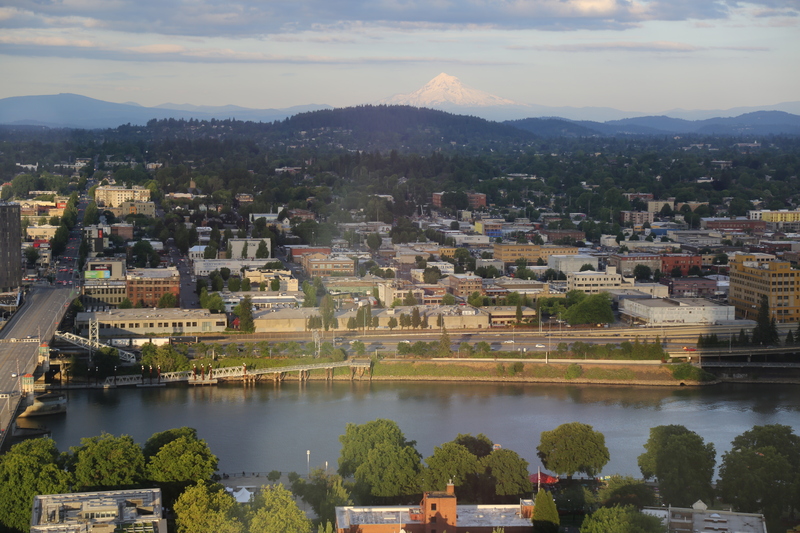 View over the Willamette River toward Mount Hood. This was from the City Grille on the 30th floor of a bank building. 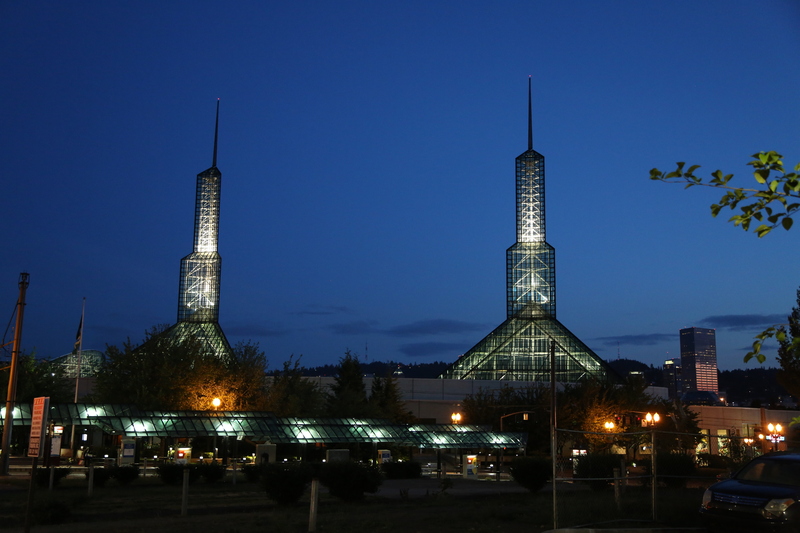 It was pretty late as we headed to our hotel a few blocks from the Portland Civic Center. Proud of this shot which was taken at night without a tripod. I hope you enjoyed day two. Stay tuned for Day Three which will have the Columbia River Gorge and pics of the second tallest continuously flowing waterfall in the United States.